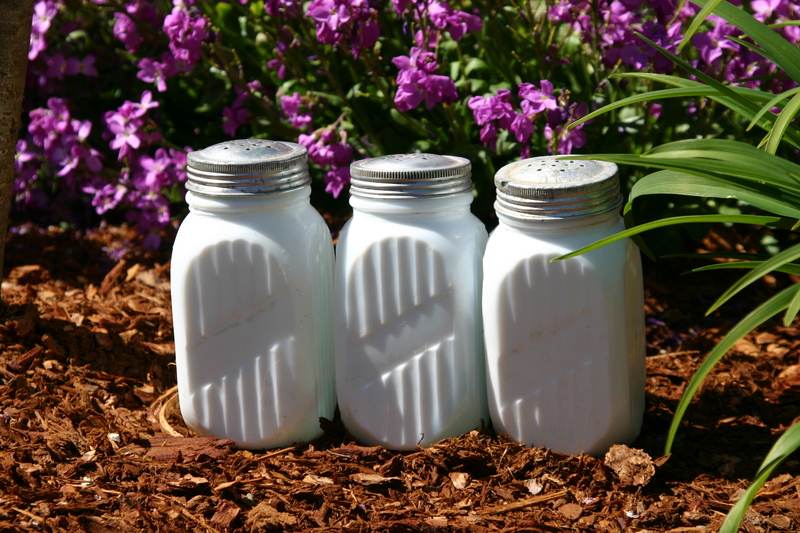 P. and G.–The White Naphtha Soap really washes clothes while they soak. You have for your other work the time you now spend with washboard and boiler. 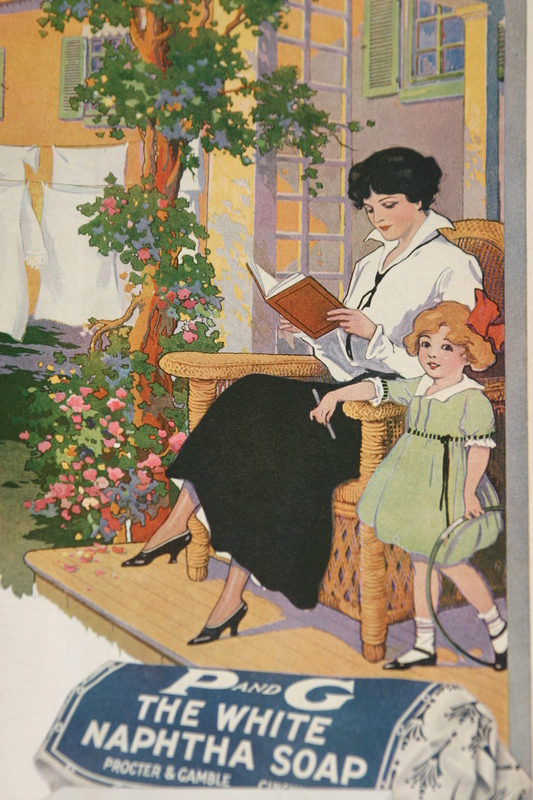 After the clothes are on the line, the best part of the day is before you to sew, read, shop, visit or romp with the children. The next ad plays on the natural guilt all mothers seem to have over the consequences of not taking the best care possible of our children. Well, I don’t know about the rest of you, but I’m going to lay the guilt aside for the moment and go take a nap. Happy Mother’s Day! 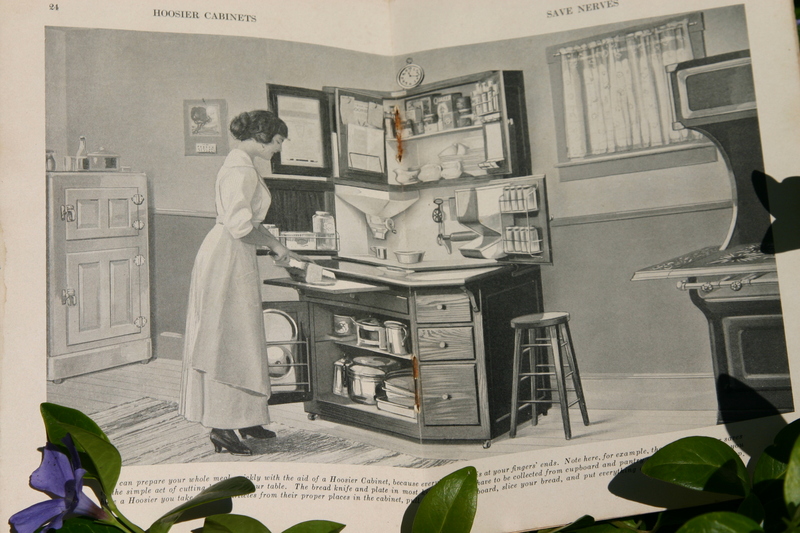 Who knew that antique cookbooks could be such fun? 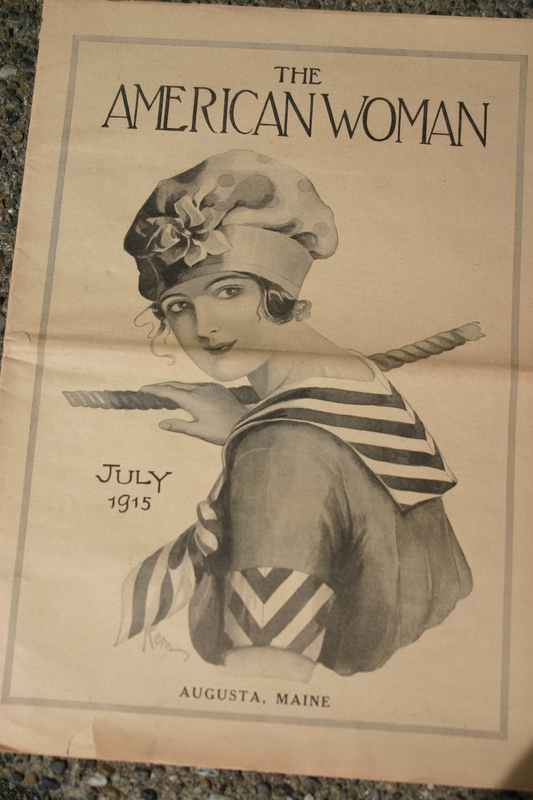 The star of today’s blog is a grand old lady, The Lakeside Cook Book, No. 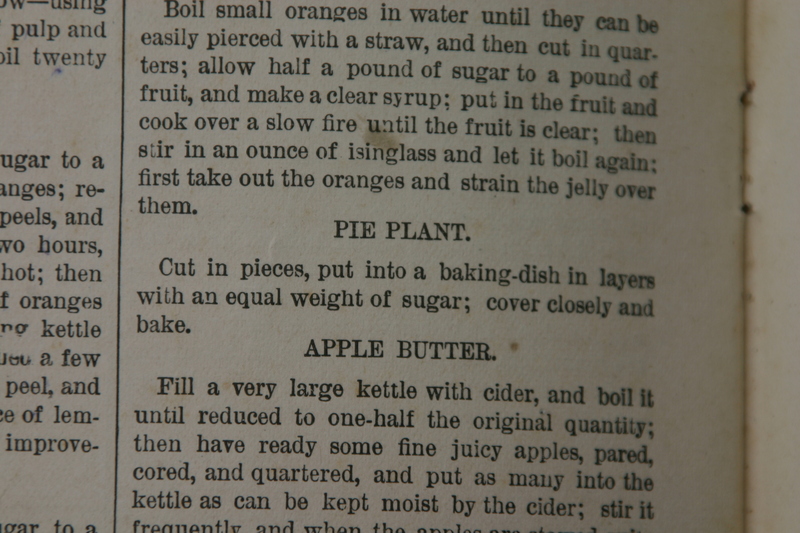 1 and 2, A Complete Manual of Practical, Economical, Palatable and Healthful Cookery. 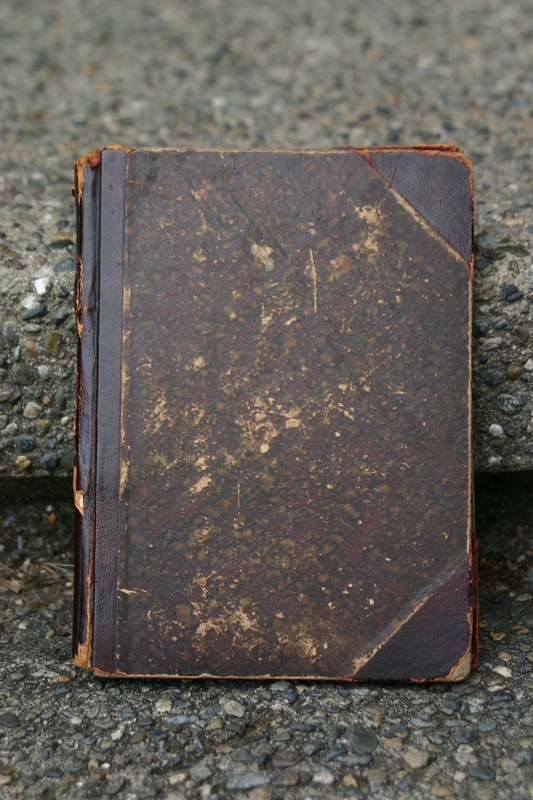 Written by “N.A.D.” and published by Donnelley, Gassette & Loyd in 1878. I think she looks pretty good for being over 130 years old. She was sent to me by my good friend, eBay, as part of my research into farm life in the early 1900’s. 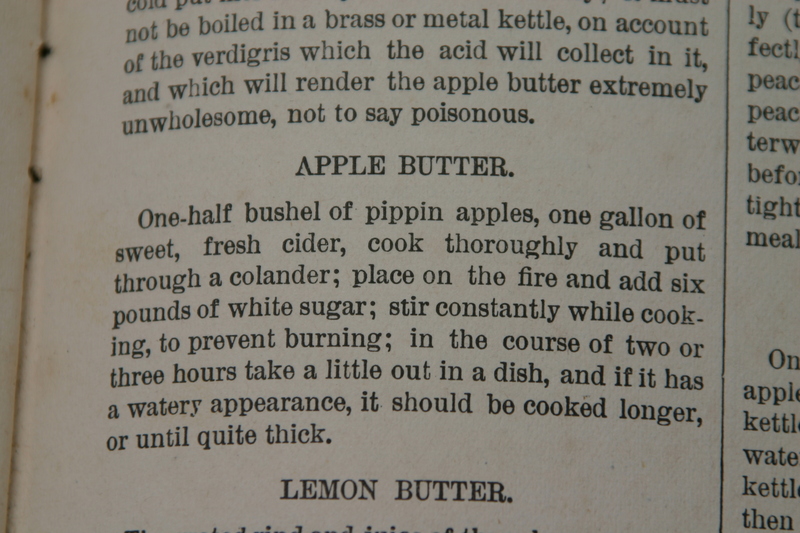 Though the book is older than that, I could easily see it still being in use in rural kitchens in 1915. 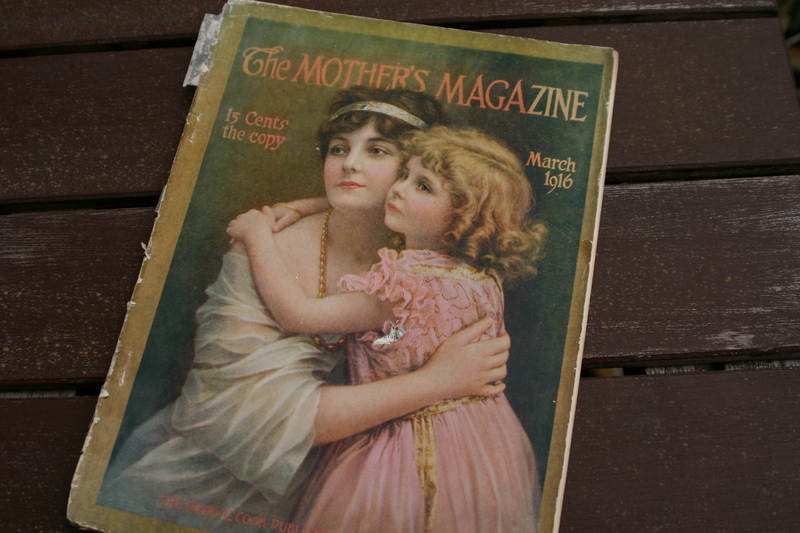 After all, I have several not-so-new cookbooks that my own mother passed on to me. In any case, relevant to my research or not, it was simply too cool to pass up. While meandering through this delightful little slice of history, I couldn’t help but notice how long many of the recipes took to complete. In the same way that gasoline laundry detergent made me appreciate my bottle of Tide, many of these recipes make me appreciate how little time I have to spend in the kitchen. 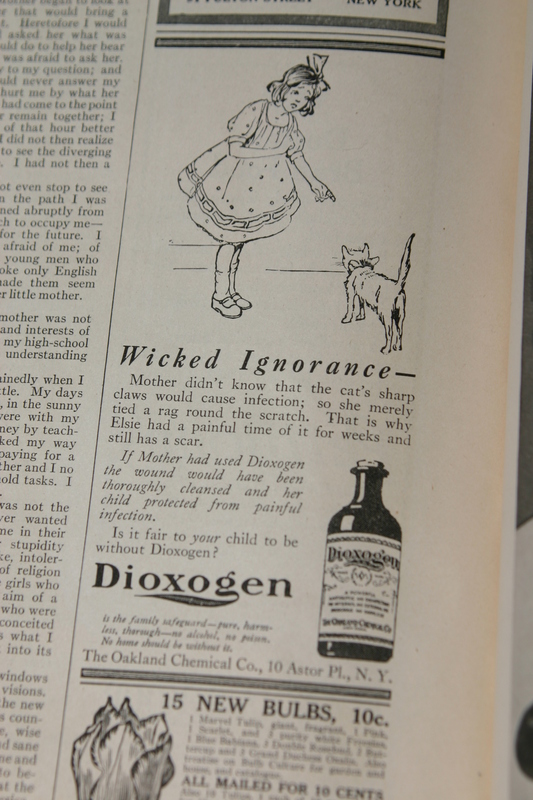 I recall that in one of my favorite childhood books, Rilla of Ingleside, by L.M. Montgomery, housekeeper Susan says one morning that if she got to work on a wedding cake immediately, she could have it ready for the oven by afternoon. I always wondered what took her so long to mix batter. Now I understand. 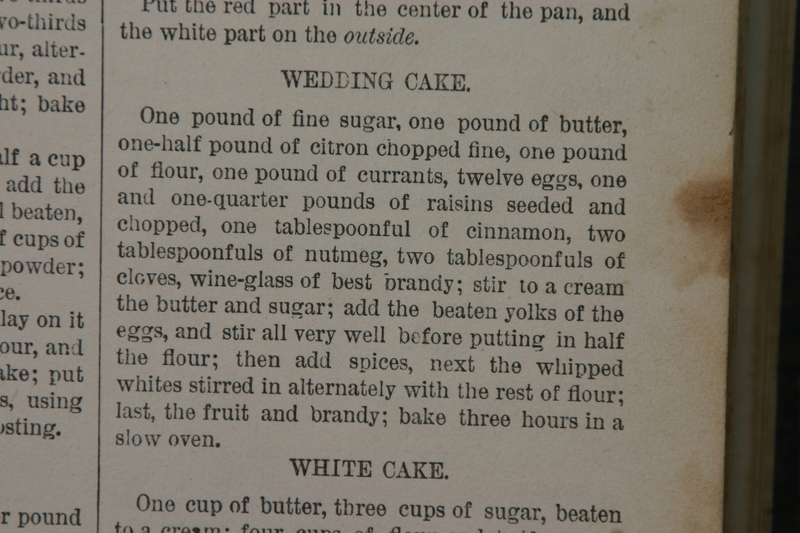 Look at this recipe for Wedding Cake. How long do you imagine it would take you to seed and chop one and a quarter pounds of raisins? The idea of having to seed any amount of raisins sends chills down my spine. 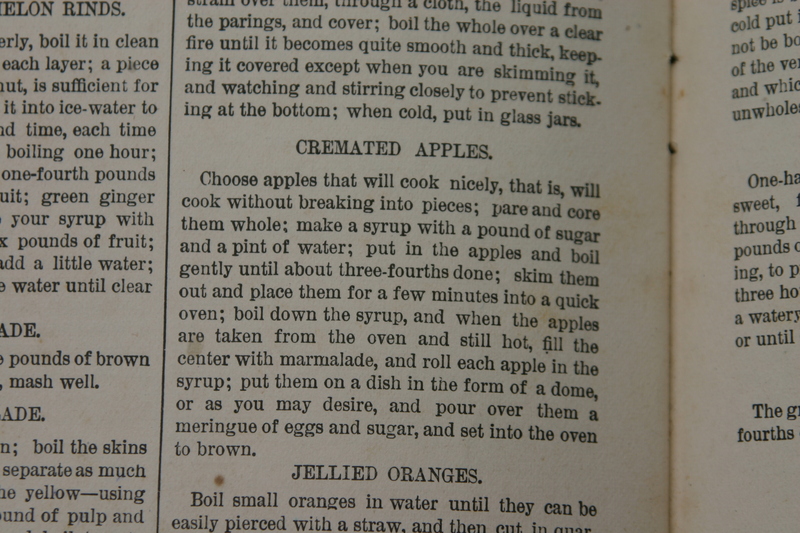 Look at this recipe cheerily named Cremated Apples. I’m having trouble imagining the final product. This recipe brings to mind another issue. There were no temperature indicators on the ovens. I remember my grandma trying to adapt her mother’s old recipe for corn pone. The recipe called for a “quick” oven, just like this one. But what exactly is a quick oven? According to Barbara Swell, in her wonderful book, Log Cabin Cooking, a quick oven was hot enough that you could only hold your hand inside for 35 seconds. In a moderate oven, you could hold your hand in for 45 seconds, and in a slow oven, you could hold your hand inside for a full minute. Some of these recipes had me googling up a storm as I had no idea what they were describing. Pie plant? Pie plant is rhubarb! I would have never guessed. Does anyone know what Irish Moss is? And look at the amount of time the following recipe would take. It turns out that Irish Moss is a particular kind of seaweed, considered a superfood when eaten raw. 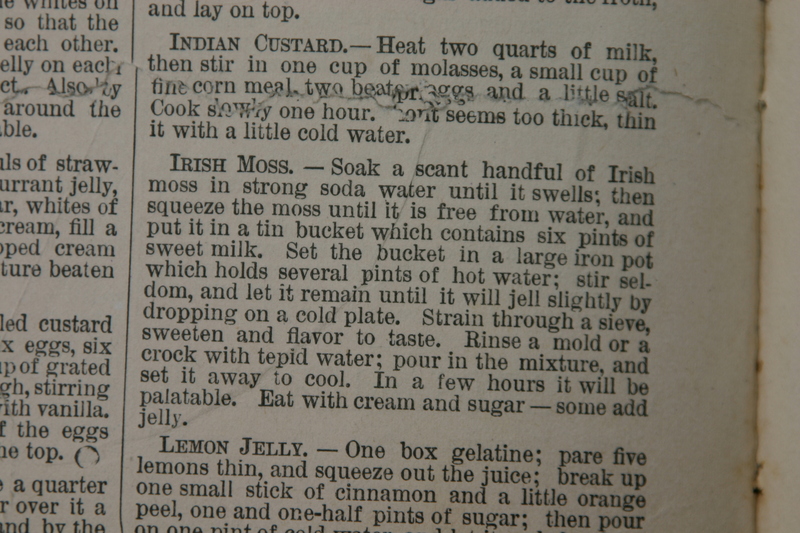 This recipe was in the category of “Custards and Creams,” and sounds as though it was cooked rather thoroughly. Finally, here is my favorite recipe. It reminds me of my grandma telling me all about making apple butter in a giant kettle in their front yard. She described how luscious the scent of the cooking apples was and how people would stop by to comment on how wonderful it smelled. I think I’ll try this one in my kitchen just to see exactly what she meant. Of course, I’ll have to have an afternoon free, if I’m going need to stir constantly for two or three hours. What do you think? Will you try any of these recipes yourself? Be sure to let me know if you do. Thanks for reading.